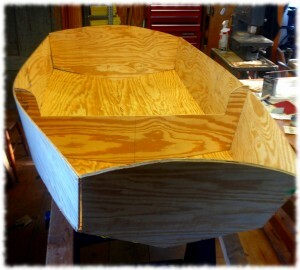 The rough shape of the boat begins to form with all the major pieces stitched in place. This afternoon I installed the starboard side and the middle frame piece. The boat shape is starting to show – though it looks a bit skewed in the picture – I think that is the angle of the camera. I need to add all the wire stitches and make sure that the shape is even before gluing. But, I think I’m finished for the night. I’ve been fighting a cold all weekend and want to take it easy tonight.